I’m all for eating whole, just plucked from the ground foods, but realistically, sometimes you have to rely on your packaged friends. When it comes to fueling the workday grind, it’s best to come prepared with a nutritious emergency stock. Maybe you didn’t have time to make it to the grocery store or farmer’s market this week, or maybe you simply left your lunch in the home fridge (been there, done that…too many times). Thankfully, there are plenty of packaged foods that pack flavor, nutrients and all-around good vibes. Here are my top 5 workday staples! Ingredients: Grade A pasteurized skimmed milk, live active yogurt cultures (L. Bulgaricus, S. Thermophilus, L. Acidophilus, Bifidus, L. Casei). Comments: So rich, so creamy and a terrific blank canvas for a variety of toppings. Trust me, I’m not afraid of fat (see my post about Bulleproof Coffee), I’ve just really come to love the mildly tart taste of Total 0%. The 6 oz. size is perfect for controlling portions and it packs a whopping 18 grams of protein. Plus, the live active cultures make for one happy gut. Ingredients: Whole grain blend (oats, brown rice, oat flour, millet, amaranth, buckwheat, quinoa), dried cane syrup, canola oil, chia seeds, maple syrup, molasses, brown rice syrup, natural flavor, sea salt, Vitamin E (to maintain freshness). Comments: This gluten-free, non-GMO and slightly sweet concoction is a slice of crunchy heaven. It boasts five super grains that are rich in nutrients including fiber and omega-3 fatty acids. 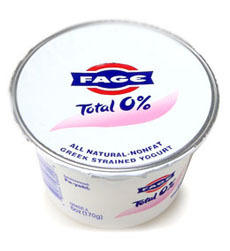 If I don’t have fresh fruit on hand, I like to top my FAGE Total 0% with 2 tablespoons of these clusters. Ingredients: Dry roasted almonds, maple sugar, palm fruit oil (sustainably sourced), sea salt. Comments: This stuff is seriously a-maz-ing. I like to pair a tablespoon of it with a banana or apple, but more often than not, I enjoy a spoonful solo for a mid-day energy boost. 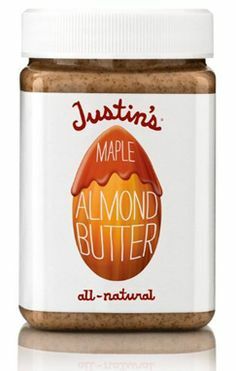 You know it’s good when the founder himself, the Justin, claims that it’s the most perfect tasting nut butter on the planet. Comments: The chip-filled break room doesn’t stand a chance–when salty cravings call, I always reach for these little green beauties. We’re fortunate to have Wonderful Pistachios as a client and my office is constantly stocked with all kinds of pistachio goodies. I love that in-shell pistachios take longer to eat, which encourages me to slowww down and be more conscious of what I’ve eaten. Ingredients: Assam black tea, green maté tea leaf, lemongrass, green tea leaf extract, lemon myrtle, natural and organic flavors, stevia leaf, essential oils, citric acid, ashwagandha, basil leaf, shankpushpi leaf, ginseng and eleuthero root extract, eleuthero root, natural orange flavor, natural tangerine flavor, natural lotus flower flavor, organic orange peel oil. Comments: Okay, this tea isn’t technically a “food,” but it’s most definitely one of my afternoon staples. The harmonizing and citrusy aroma helps energize and elevate my mood without fail. It also helps that each tea bag comes with a cute little inspiring message, i.e. “Be proud of who you are.” Thanks, Yogi! Best Ingredients gives us the best taste with lot of vitamin and mineral supplements.